A 39-year-old man was taken to hospital after the alleged attack in Edinburgh. 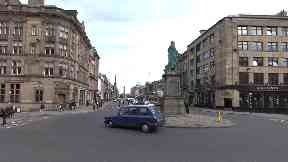 Edinburgh: A man was allegedly jumped in the city centre. Two suspects have been arrested after a man was allegedly assaulted in a city centre. The incident happened on George Street near the junction with Frederick Street in Edinburgh at 3.20am on Wednesday. A 39-year-old man was taken to hospital with serious head and facial injuries. Two men, aged 19 and 20, have been arrested in connection with the incident. A Police Scotland spokesperson confirmed: "Police in Edinburgh can confirm that two men aged 19 and 20 have been arrested in connection with a serious assault in the city centre. "The incident happened at around 3.20am on Wednesday, December 5 on George Street, near to the junction with Frederick Street.